The Ferguson Farmers Market is a staple in the community and has become the event to access fresh food and wholesome fun for residents and guests alike. However, on August 14, 2014 – a week after the death of Michael Brown – the future of the market and its art programs were uncertain. Art Therapist Dana Sebastian-Duncan of the Queen of Peace Center and co-founder/board member of the Northern Arts Council, had an idea to welcome fellow artists, visitors and everyone in the neighborhood back to the Ferguson Farmers Market by providing a creative outlet for the entire community to share their thoughts and feelings. She’d rely on the power of art. The art project would soon grow to include all sorts of expressions, gaining momentum and growing into a grassroots movement. 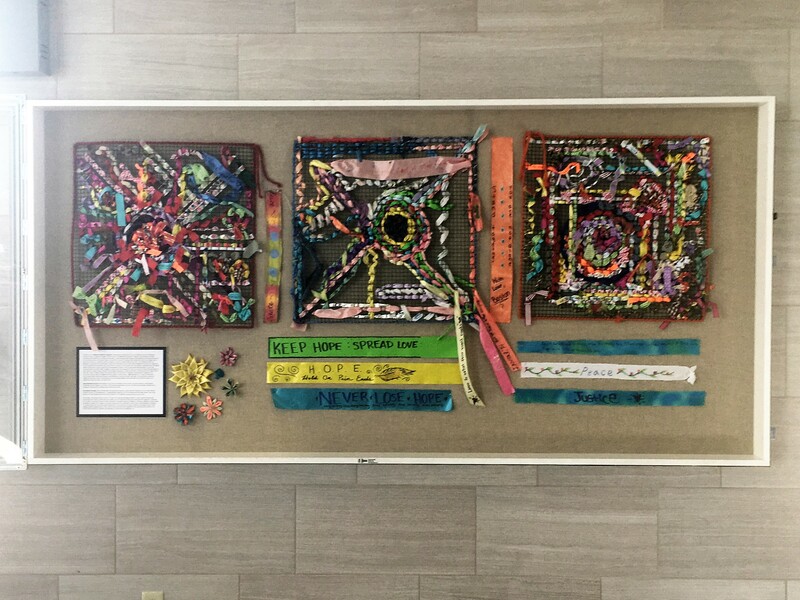 As news about the project spread, Missouri Art Therapists and groups in other communities, including some as far away as Ohio, Wisconsin, Texas, Florida and New York, created ribbons and sent them to Ferguson, expressing their support for the community. One of the ribbons Sebastian-Duncan remembers was one of the first written for the project. A sampling of the Ribbons of Hope for Ferguson art project is now on display at the North County Transit Center. “I hope riders will experience the art, read the messages and perhaps reflect on their own hopes, wishes, prayers and dreams of a better future, as we move forward, and come together as a community,” Sebastian-Duncan said.